You are currently browsing the Bookmobile News weblog archives for August, 2012. Wow, what a gift! 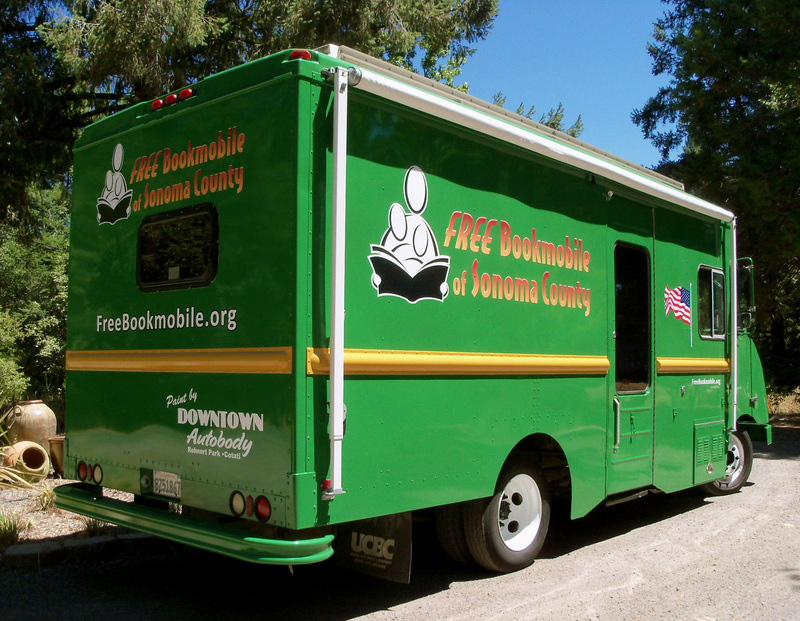 The community-minded folks over at Downtown Autobody in Rohnert Park/Cotati were moved to help us renew the appearance of the Free Bookmobile and did they ever! Completely free of charge, they cleaned up all the rust and other body issues and laid down a beautiful green base with Bahama yellow accent striping. Then they referred us over to Sign-A-Rama of Rohnert Park for the graphics treatment. We are simply delighted with the result. No more anonymity on the roads out there, now we’re rolling loud and proud. We’ll get some photos up on our website soon but for now you can see more images on our Facebook page (http://www.facebook.com/freebookmobile). The final step will be a giant mural along the driver’s side, hopefully to be completed in the fall. Be sure to wave or honk when you see us around town!